Armored Saint are on the road now with metal legends, Saxon! The tour continues tonight in Washington D.C. with the remaining dates listed below. 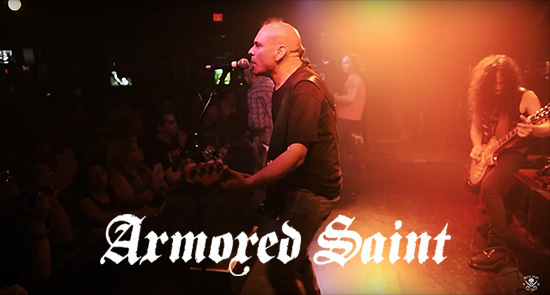 Earlier this summer, Armored Saint performed a special headlining gig at Count’s Vamp’d in Las Vegas to a sold out crowd. The show was captured on film and two tracks were cut to serve as official live bootlegs. Watch the classicSaint track “Dropping Like Flies” and a new song, “Mess,” now at metalblade.com/armoredsaint! Watch the group’s latest music video for “Win Hands Down” and order your copy of the album at metalblade.com/armoredsaint. Also, the brand new official webstore is online now. Visitindiemerch.com/armoredsaint for exclusive t-shirts and merch. More items are coming soon! ARMORED SAINT is front man John Bush and bassist Joey Vera, guitarist Phil Sandoval and his brother, drummer Gonzo Sandoval and guitarist Jeff Duncan – five masters of metal that combine to forge one of the genre’s most criminally-unsung forces. Win Hands Down debuted at #71 on the Billboard Top 200 current albums chart during its week of release. The album also reached #33 on the German Top 100 albums charts, and #32 on the Canadian Hard Music Charts.